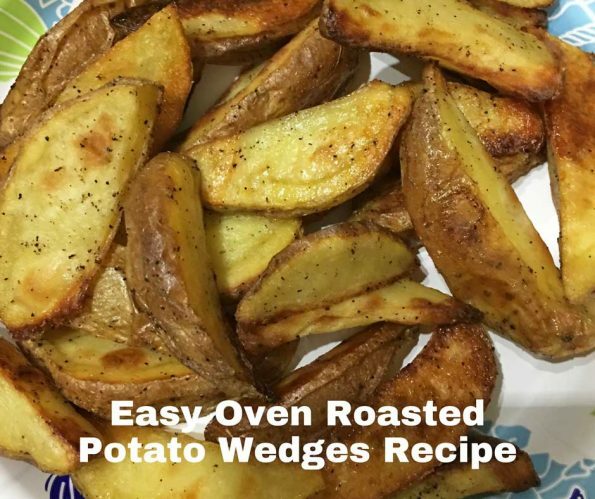 This oven roasted potato wedges recipe is the best, easy and simple roasted potato wedges recipes which you can easily prepare with minimal efforts. And I want to mention that this oven roasted potato wedges recipe is the 300th blog post in this blog as well! 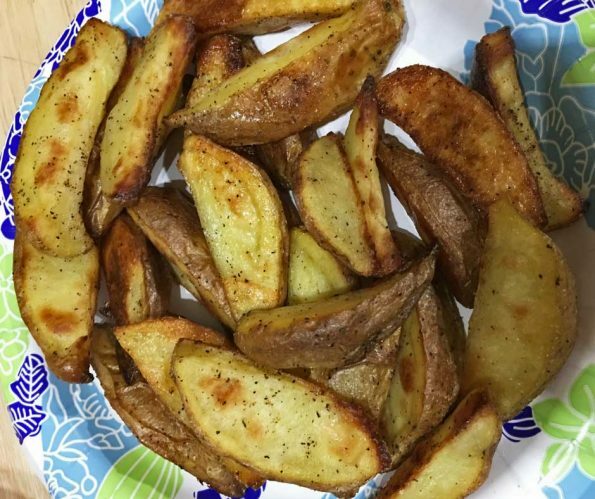 :) The roasted potato wedges are delicious and kid friendly, as we do not use many spices, this can be made easily and enjoyed as a snack or side dish with lunch or dinner. One thing I want to stress for this recipe is to make sure to use medium sized potatoes, as I have noticed that it is much easier to cut evenly sized potato wedges that get roasted nicely, when you use medium sized potatoes. If you use large sized potatoes, the wedges will be thicker and larger than medium, and if you use smaller potatoes, the wedges will be smaller than the medium sized potatoes, in both cases, there could be difference in roasting time and it is much easier to do if we use medium sized potatoes, with which you can easily cut the right sized wedges and roast them perfectly. If you use this cutter along with this wedge blade it will help you with cutting the potato wedges so nicely, or you can use this complete set of french fry cutter, you also get the wedge blade along with it as it is a combo set. There are other brands of french fry cutters with wedge blades that come in a lower price like this french fry cutter with wedge blade set and also this one. The seasoning I have used here is very simple – salt, oil and ground black pepper which works well for this recipe. If you want to add more spices and flavors, feel free to experiment with based on your preferences. Some ideal recommendations would be garlic powder, ginger powder, curry powder etc which will add the nice flavors to the roasted potatoes. 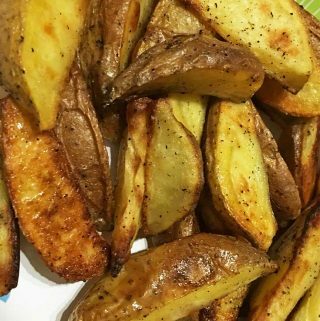 This oven roasted potato wedges recipe is a kid friendly recipe as well and as we use very little oil compared to deep fried potatoes like french fries or potato chips, this is a better choice with regards to health too! 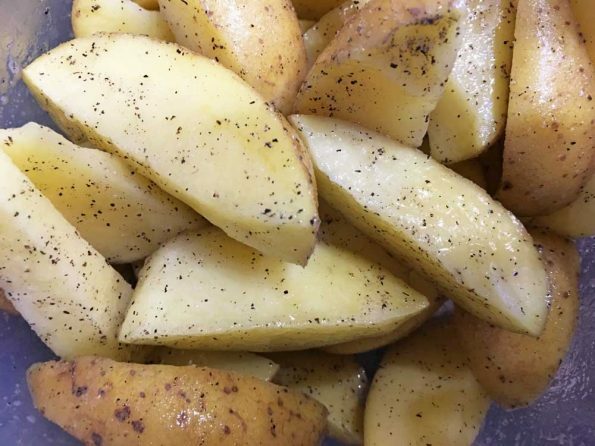 It is very easy to cut the potatoes in slightly thick wedges and you just toss them after adding the seasoning in a baking sheet and get them roasted. I didn’t remove the skin of the potatoes, but you may remove if you wish to. I recommend keeping the skin of the potatoes, after cleaning the potatoes very well using water, as they make the potato wedges more delicious. I used regular yellow potatoes but you may experiment with other varieties of potatoes as well. See my other potato recipe here like this roasted creamer potatoes recipe, smashed roasted red potatoes recipe, pan fried baby potatoes recipe and this easy simple oven roasted potato salad recipe. So here is how you can easily make the roasted potato wedges following this easy oven roasted potato wedges recipe. 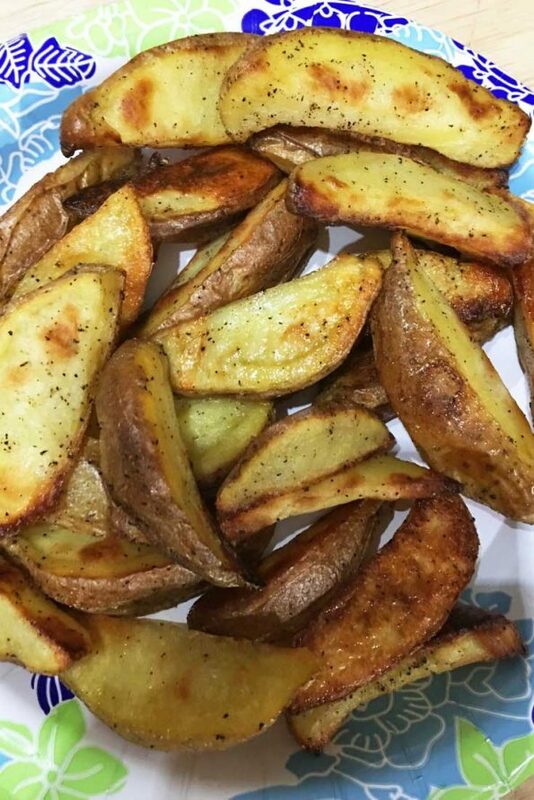 Oven roasted potato wedges recipe is very simple and easy to follow, which will help you to make delicious and kid friendly oven roasted potato wedges easily. Enjoy these delicious and simple potato wedges as a snack or side dish. Wash the potatoes very well and cut the potatoes in slightly thick even sized wedges. Transfer the potato wedges to a large bowl, add the oil, salt and black pepper powder, mix everything well until the all the potato wedges are evenly coated with the seasoning. Arrange the potato wedges in a single layer in a greased baking sheet or arrange them in a baking sheet lined with non stick silicon mat or foil to make the job more easier. Bake for about 45 minutes or until the potato wedges turn golden brown in color. Transfer the roasted potato wedges from the oven immediately to avoid further browning. Serve the delicious roasted potatoes for lunch, dinner or snack. You can also serve the potato wedges along with tomato ketchup, mayonnaise, guacamole or any sauce you like. 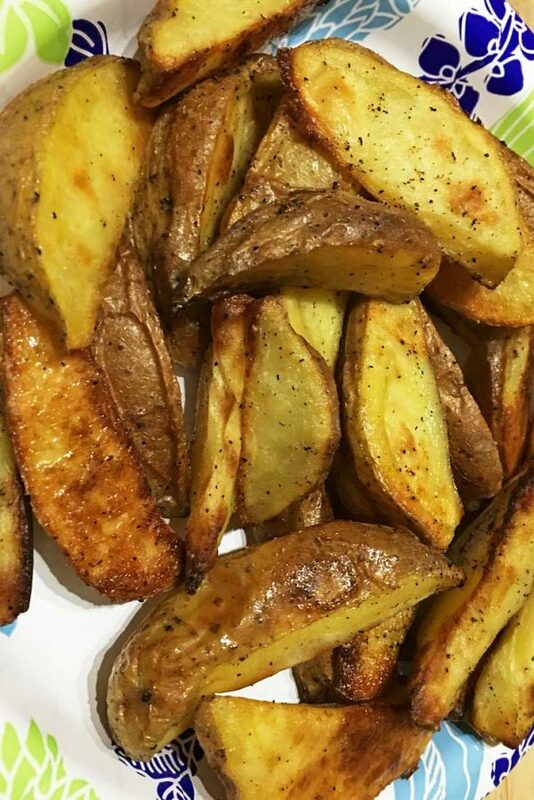 Hope you found this post on oven roasted potato wedges recipe helpful in making easy and yummy oven roasted potato wedges for a super easy vegetarian/vegan side dish that is also kid friendly!